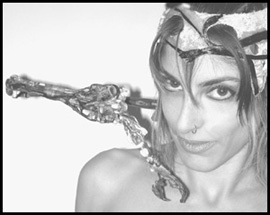 Psymbiote in film: Psymbiote: Exploring the Cyborg Body is avaialable for viewing on Vimeo. Recently screened at the Moscow Biennale and Moscow International Film Festival. 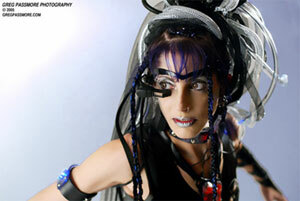 Psymbiote curated and hosted the SIGGRAPH CyberFashion Show, 2002-2005. Notable features include G4 TechTV, NPR and Wired News. 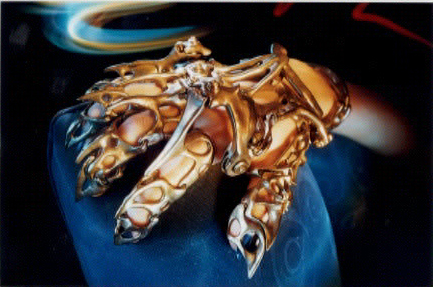 Tiger Lee Photography CyberFashion 2003 Photo Montage still available. 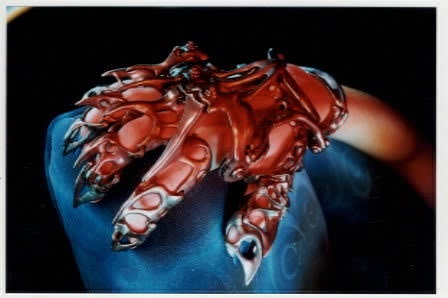 Interested in purchasing a Psymbiote titanium glove v.1 or individual 3 jointed finger ring? Please read this first. Adorned in titanium, latex, silicone, and electronic apparatus, isa becomes Psymbiote to place herself in the eye of the storm: the conceptual terrain at the collision of bodies and machines, the mutation of her own identity through transformation of the body. 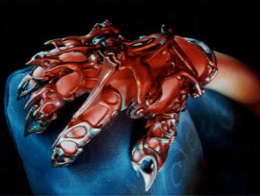 Ultimately the project seeks to fully transform the artist into a seductively organic yet entirely unfamiliar hybrid organism, a human/machine chimera with fully integrated control systems. Psymbiote's costume currently includes custom visual LED displays of heart rate and voice, and has been occasionally augmented with a full wearable system and HMD. 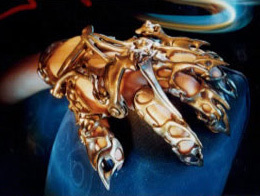 A new version of the titanium glove is being redesigned so it can be outfitted as a 5DT data input device. A variety of devices are in development to animate this techno-body with movement, sound, and light as an expressive personal medium activated by manual triggers, automatic body processes, or remote control. As her evolution progresses, Psymbiote appears in public spaces to stimulate dialogue regarding the future of technological enhancements to the human body. She has already been sighted at a number of universities, art shows, international conferences, and as host of the SIGGRAPH CyberFashion Show. The Psymbiote Project brings issues raised by the ongoing redefinition of our bodies into a public forum, highlighting some of the contemporary critical discourse surrounding cyborgs and all forms of human/technology integration.